Global closed system transfer device market expected to generate around USD 1,180 million by 2025, at a CAGR of around 20.2% between 2019 and 2025. Closed system transfer devices (CSTDs) allow safe drug transfer while restricting the inflow of environmental contaminants and outflow of drugs to be transferred into the system. The report covers a forecast and an analysis of the closed system transfer device market on a global and regional level. The study provides historical data for 2016, 2017, and 2018 along with forecast from 2019 to 2025 based on revenue (USD Million). The study includes drivers and restraints of the closed system transfer device market along with their impact on the demand over the forecast period. Additionally, the report includes the study of opportunities available in the closed system transfer device market on a global and regional level. In order to give the users of this report a comprehensive view of the closed system transfer device market, we have included a competitive landscape and an analysis of Porter’s Five Forces model for the market. The study encompasses a market attractiveness analysis, wherein all the segments are benchmarked based on their market size, growth rate, and general attractiveness. The report provides company market share analysis to give a broader overview of the key players in the closed system transfer device market. In addition, the report also covers key strategic developments of the market including acquisitions & mergers, new product launch, agreements, partnerships, collaborations & joint ventures, research & development, and regional expansion of major participants involved in the closed system transfer device market on a global and regional basis. The study provides a decisive view of the closed system transfer device market based on closing mechanism, type, technology, component, end-user, and region. Based on type, the market is segmented into membrane-to-membrane systems and needleless systems. Based on the closing mechanism, the market is segmented into color-to-color alignment systems, push-to-turn systems, click-to-lock systems, and Luer-lock systems. Based on component, the market is segmented into syringe safety devices, vial access devices, accessories, and bag/line access devices. Based on technology, the market is segmented into compartmentalized devices, diaphragm-based devices, and air cleaning/filtration devices. Oncology centers and clinics, hospitals, and others comprise the end-user segment of the market. The regional segment includes the current and forecast demand for North America, Europe, Asia Pacific, Latin America, and the Middle East and Africa. 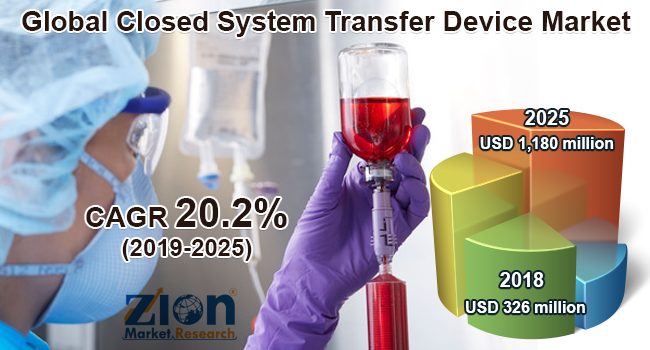 Some key players of the global closed system transfer device market include ICU Medical, Inc., Becton, Dickinson, and Company, JMS Co., Ltd., B. Braun Melsungen, Teva Pharmaceutical Industries Ltd., Equashield, Yukon Medical, Corvida Medical, Codan Medizinische Geräte GmbH & Co Kg, Caragen Ltd., Victus, Inc., and Baxter International Inc.